Many of those in attendance at the London Stadium on Saturday night had hoped to see Usain Bolt win his final individual race at a major championships. In the end, they were left disappointed. The Jamaican, returning to the scene of his 2012 Olympic successes, could only finish third in the World Championship 100m final. Christian Coleman of the US finished second, with his countryman Justin Gatlin winning the race. The crowd had booed Gatlin, who served two doping bans earlier in his career, at every opportunity during qualifying for the final. This continued ahead of the race and after it, when his victory was confirmed. After Gatlin celebrated his victory by putting a finger to his lips as if to silence the crowd, Bolt was seen congratulating him. 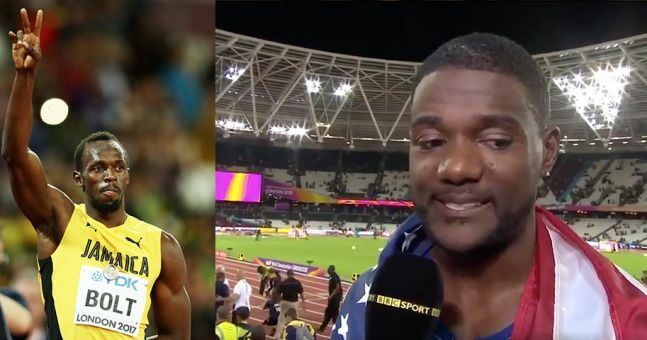 Speaking to the BBC afterwards, the American explained that as well as offering his congratulations, Bolt had also told him that he didn't deserve to be booed by the spectators. "The first thing he said to me was 'congratulations, you worked hard for this,'" Gatlin explained. "And he said 'you don't deserve these boos' and I thanked him for that. I thanked him for inspiring me throughout my career. He's an amazing man."